I've already wonked out on the history of Alchemist, but basically they started out as an obscure brewpub that was destroyed by the dread Tropical Storm Irene. Fortunately, they had just built a production brewery and canning line, so they survived by making tons of Heady Topper and pretty much only Heady Topper for a few years. The brewpub was never reopened, but a couple years ago, they started reviving old recipes and doing limited releases. Flash forward a couple years, and they've opened a new (gorgeous) production brewery that basically doubled their capacity and allowed them to start making those other recipes on a more regular basis. 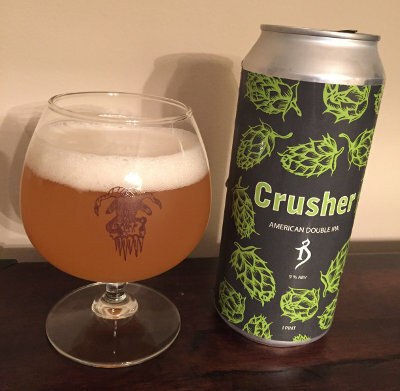 The focus of the new brewery seems to be Focal Banger, their 7% IPA, but they also have some capacity dedicated to a "rotating" beer, which for now is The Crusher. Beer Nerd Details: 9% ABV canned (16 ounce pounder). Drank out of a snifter on 8/12/16. This page contains a single entry by Mark published on August 18, 2016 11:30 PM. Frost Beer Works Plush was the previous entry in this blog. Weyerbacher 21st Anniversary Ale is the next entry in this blog.